We are located off of Rt. 52 in Pine Bush, NY at 184 Quannacut Road. We are about ninety miles northwest of Manhattan. Directly take the NY Thruway north from the Triboro Bridge. Exit the NY Thruway at Exit 16 (NOT Exit 15 or 15A) . From Exit 16 take Route 17 toward Harriman (Middletown). Continue approximately 20 miles to Exit 119 for Pine Bush. From Exit 119 take Rt. 302 north for approximately 15 miles. Turn left at Rt. 52 and follow local directions below. Take Rt. 84 west over the Hudson River. Stay on Rt. 84 to Exit 4W (Middletown / Rt. 17). Take Rt. 17 west to Exit 119 for Pine Bush. Take Rt. 209 south to Rt. 52 east. Continue through Cragsmoor and Walker Valley. Quannacut Road is 4.8 miles past Cragsmoor Road. There is a traffic light at Quannacut Road. 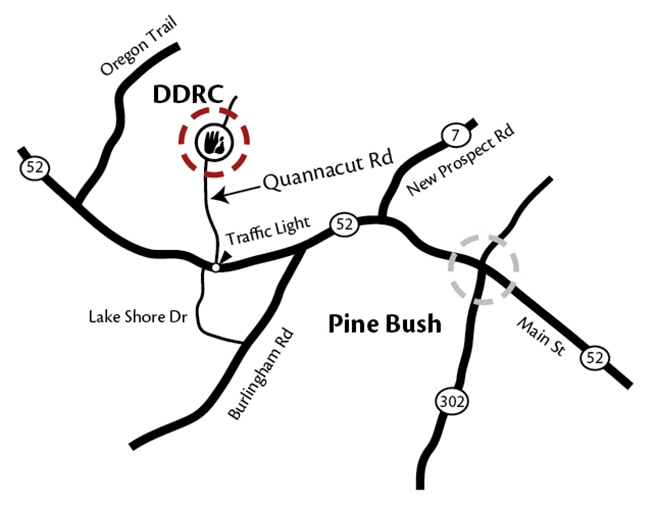 Turn left onto Quannacut Road and follow local directions below. Take Rt. 299 north to Rt. 7 south. Turn right at Rt. 52 and follow local directions below. Take Rt. 52 west into Pine Bush. Continue through the downtown area to corner of Rt. 302. Continue on Rt. 52 and follow local directions below. Take Rt. 52 west from the corner of Rt. 302. Continue west on Rt. 52 for 2.5 miles. Second traffic light after Rt. 302 is Quannacut Road. Turn right onto Quannacut Road continue 8/10 mile. Two stone pillars mark the entrance to DDRC. First house on the right is the Reception Hall. Turn right into the driveway, then turn left past the staff parking area. Park in the large visitor’s parking lot. Turn right into the driveway and pull up to the stone steps at the main entrance. This airport in Newburgh, NY is closest one to us, about twenty minutes away by taxi. Note that this is a small airport, and direct flights may not be available from all cities. In Newark, New Jersey, about two and a half hours from our center. From there you can take the Airtrain, to Middletown, NY. From Middletown, NY train station you would take a taxi to our center. In Queens, NY, about two and a half hours from our center. Use a car service such as Hudson Valley Transportation, 845-605-4555. You can check the schedule of train services from the website of New Jersey Transit (973-275-5555). The destination station is Middletown, New York. Coming from New York City, you would board this train at New York Penn Station, and you would need to change trains at Secaucus Junction. The trip takes about an hour and ten minutes. The Middletown train station is about thirty minutes from our retreat center by taxi. You can check the schedule of bus services from the website of Short Line Bus (845-610-2600). The Middletown bus station is about thirty minutes from our retreat center by taxi. If you are flying into Newark Liberty International Airport in Newark, NJ, from there you can take the AirTrain, to Middletown, NY (973-961-6000). At Newark Liberty International Airport, follow the signs to the AirTrain. Select the NJT rail ticket option. The cost of the ticket is approximately $25.00. IMPORTANT: This one ticket is used for the AirTrain and all other trains on your journey. Board the AirTrain and exit at Newark International Airport train station. At Newark International Airport train station, board the next available train heading to NY-Penn station. NOTE: You are not going all the way to NY-Penn station. Exit the train at Secaucus Junction (2nd Stop). At Secaucus Junction, transfer to the Main/Bergen/Port Jervis Line. This train will take you to Middletown NY train station. From Middletown train station take a taxi to our center.